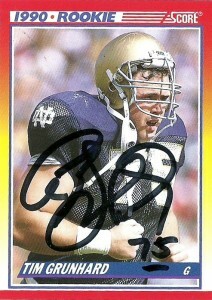 Tim Grunhard is best remembered as one of the more solid centers in the NFL during the 1990’s for the Kansas City Chiefs after an outstanding career at Notre Dame. Tough, aggressive, and nasty, Lou Holtz was once quoted as saying of Grunhard: ” He’s a throwback to the day when helmets could be folded up and stuck in your back pocket. He would love football even more if he didn’t have to wear a facemask.” Grunhard was not only a competitive and strong center , he doubled as a longsnapper as well, saving the team some valuable roster space. Tim played for the Chiefs from 1990- 2000. Over his 11 seasons, Tim played in 164 games- 3rd in team history, and one ProBowl in 1999. He did some time as a commentator on a Sports radio show with Bill Maas, and then coached football at a Catholic school in Kansas. As of 2012, Grunhard was coaching offensive line for Charlie Weis on the Jayhawks.